An apple a day keeps the doctors away, but no one ever said anything about leaves. On Tuesday, October 4 Grade 6 Blackville students Jules Keenan and Emily Peterson found an apple that had something very unusual about it. Emily was digging through her lunch can and found a bright red shiny apple. 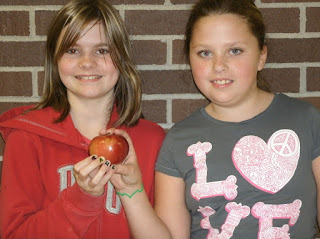 Thanks to her friend Jules, the apple was saved. Jules noticed a subtle imprint of a leaf on the apple. 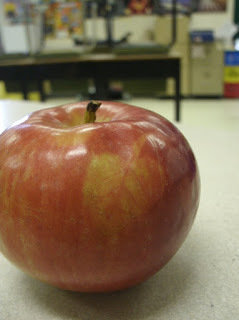 Seeing that this was a special apple Emily traded it with her teacher, Mrs. Carmel Fiander for another apple, and the apple is now kept in the science room.